Dagmar and I are celebrating our 10th anniversary this month, and in part we attribute our success in building a relationship to what we learned at The Legacy Center here in the Research Triangle over a decade ago. We are still Utilizing the Relationship Feedback Technique demonstrated in the November 2014 Let Magic Happen blog. The Legacy trainings are described in Chapter 12 of Let Magic Happen: Adventures in Healing with a Holistic Radiologist with a summary in the excerpt below. The Leadership Program includes a community service project selected, planned and carried out by the participants. 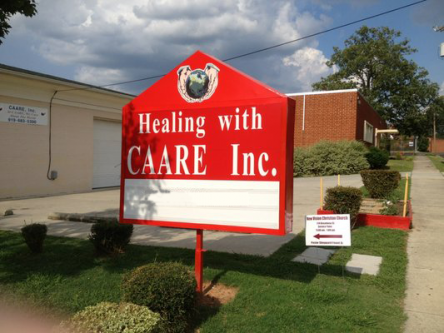 One project that directly impacted me was done at CAARE, Inc., a Durham non-profit providing a free clinic and holistic services for the homeless and veterans, where I have volunteered in the acupuncture program and taught EFT since 2010. Over 50 volunteers worked 37+ hours over the weekend of November 19-21, 2010 to provide CAARE with a renovated and expanded kitchen area, a new acupuncture room, and a refinished stage used for education and celebration. The many CAARE programs directed by Sharon Elliott-Bynum, PhD, BSN, RN, are outlined in more detail in the CAARE, Inc. article. The next cycle of Legacy Center trainings begins this Wednesday, 11/19/14, so join the Journey now. The Legacy Center had its origin in the 1990s from Lifespring, which began in 1974 and arose out of the Human Potential Movement of the 1960s. The trainings have traditionally included many experiential components, such as the ropes course, visualization exercises, relaxation techniques, encounter groups, and NLP techniques. Over time, the programs have evolved into a more relationship-based, heart-centered approach, although there are occasional people for whom this format is not a fit. Participants lacking in basic ego strength sometimes do not fare well with exercises designed to get back to an authentic sense of self by letting go of old stories. The intent is to give people new choices, free from the influences of past history, about their perspectives and their actions. This process requires confronting our egos and embracing personal responsibility rather than giving the power to external influences in our lives. For relatively high-functioning people who need a few breakthroughs to take their lives to the next level, the Legacy trainings can be a pivotal and transformative step. As a basis for the creation of a healthy relationship, Dagmar and I have found the trainings to be unsurpassed in accomplishing that goal. We were so impacted by the grounding and debriefing sessions and the use of feedback, we have incorporated what we learned into our daily routines to keep ourselves on track. The key principle of the feedback process is to always ask permission, then to speak authentically from the heart. We’ve also gotten in the habit of setting an intention as a couple before any important event. At the close of each day, we ask each other first what wasn’t working and then what was working. It helps to assume any breakdown will lead to a bigger breakthrough. Setting this context for a relationship is one of the key elements required to let magic happen. The alchemical process of how turning points actually occur in people’s lives remains an ongoing topic for discussion. For now, let’s just say it’s still a mystery. CAARE offers an Integrative Medicine approach to healing, combining holistic, non-invasive, and mind-body-soul techniques with traditional clinical care. The Holistic Center offers acupuncture, EFT Tapping, and massage; as well as reiki, mind-body-spirit, yoga, and meditation classes. I originally started out volunteering to do the ear acupuncture detox protocol with a team of community acupuncturists, and then switched to teaching EFT in the context of the CAARE 12 Step Program.